· The parents can tell them the stories that have been narrated of the children of the Sahaabah at the time of the Prophet (peace and blessings of Allaah be upon him), how they fought those who tried to harm him, how quickly they responded to his call and obeyed his commands, and how they loved that which he loved, and how they memorized the hadeeth of the Prophet (peace and blessings of Allaah be upon him). · They should teach her – according to her level of understanding – about the life of the Prophet (peace and blessings of Allaah be upon him) and his military campaigns, and the lives of the Sahaabah, both men and women – may Allaah be pleased with them, so that she will grow up loving these noble people, and be influenced by their behaviour, and will be keen to strive and sincere in correcting herself and supporting her religion. · The Sahaabah and the salaf (early generations) were keen to teach their children about the life of the Prophet (peace and blessings of Allaah be upon him), and they would teach it alongside teaching the Qur’aan, because his seerah is the interpretation of the the meanings of the Qur’aan, as well as stirring up emotions and demonstrating true Islam and having a wondrous effect on the soul. It also carries the meanings of love and jihad to save mankind from misguidance and bring them to guidance, from falsehood to truth, from the darkness of jaahiliyyah to the light of Islam. When telling their daughter about the life of the Prophet (peace and blessings of Allaah be upon him) and the lives of the male and female Sahaabah (may Allaah be pleased with them), the father and mother must tell her about things that she can relate to, such as the childhood of the Prophet (peace and blessings of Allaah be upon him), some stories about his life with (his wet-nurse) Haleemah al-Sa’diyyah, and how Allaah bestowed goodness and blessings upon Haleemah and her family because of him (peace and blessings of Allaah be upon him), the night of the Hijrah and how Allaah covered the eyes of the mushrikeen, and other stories which demonstrate how Allaah helped him. Thus the girl’s heart will be filled with love for Allaah and love for His Messenger (peace and blessings of Allaah be upon him). 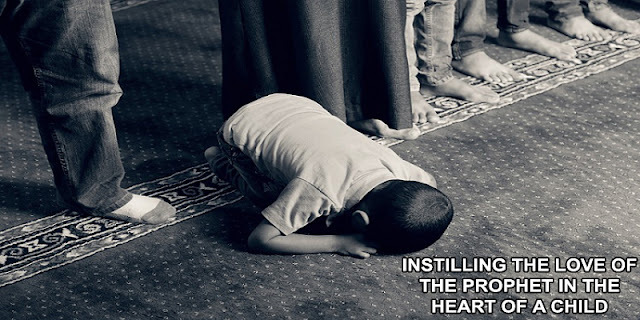 It was narrated from ‘Ali (may Allaah be pleased with him) that the Prophet (peace and blessings of Allaah be upon him) said: “Train your children to acquire three characteristics: love of your Prophet, love of his family and reading the Qur’aan, for the bearers of the Qur’aan will be in the shade of Allaah on the Day when there will be no shade except His, with His Prophets and His chosen ones.” (Narrated by al-Suyooti in al-Jaami’ al-Sagheer, p. 25; classed asda’eef by al-Albaani in Da’eef al-Jaami’ al-Sagheer, p. 36, no. 251). It would be a good idea if the parents devote a suitable time for teaching the life of the Prophet (peace and blessings of Allaah be upon him) during the daily family lesson, when the children can read about seerah in simplified books, or the father or mother can tell them these stories in a manner that is appropriate to the child’s age.